Lovely case design and high-performance movement. Watch is an icon with historical significance. 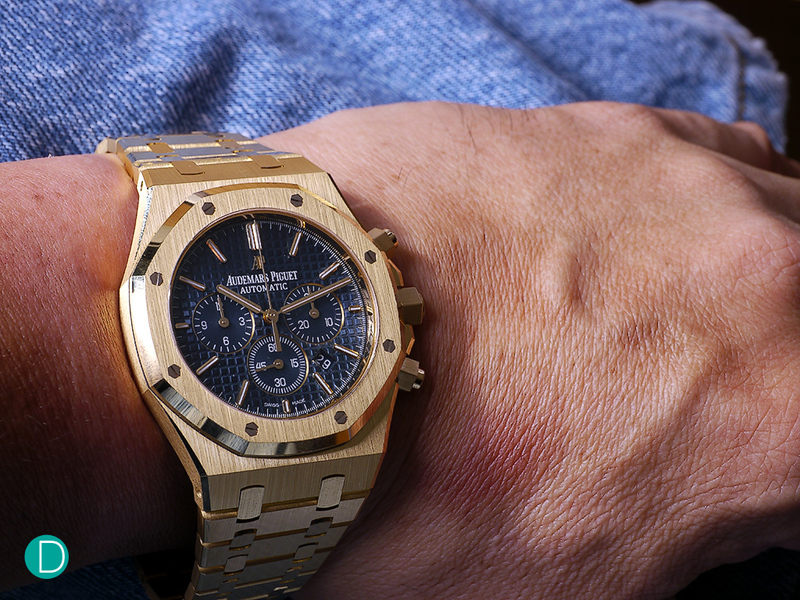 Yellow gold is arguably a rarity for the Royal Oak. Some say its just a change in metal and the price premium over the steel is hard to 'swallow'. Others find that the bling may be too much in a world that values humility or the pretentiousness thereof. 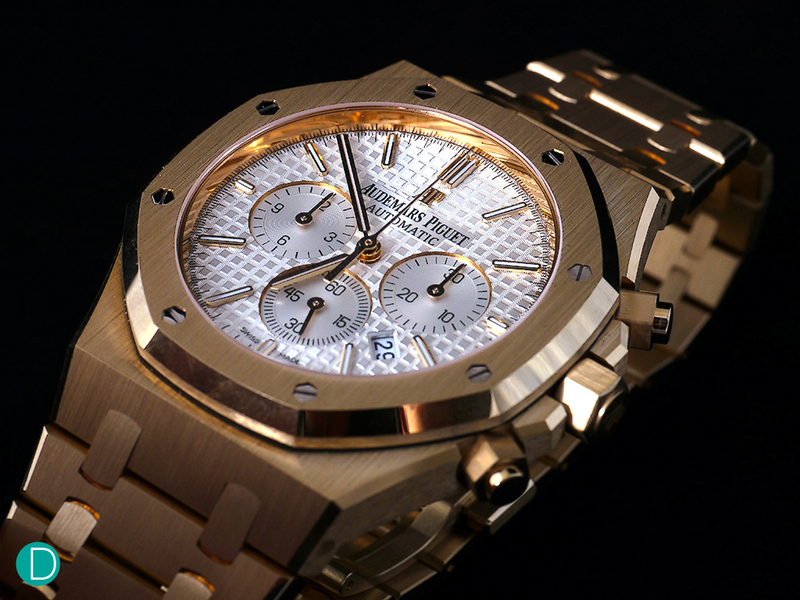 Audemars Piguet releases her latest Royal Oak Chronograph 41 mm in yellow gold (ref. 26320). While the design of the watch is essentially the same as its previous variant, Audemars Piguet takes convention and breaks it apart by its choice of gold. Usually associated with being ‘old-fashioned’ or too ostentatious, the yellow gold metal is frequently passed over for pink/rose gold. Strange as it seems, this release by Audemars Piguet challenges its notorious reputation as the diamond studded rapper’s choice watch with an equally bling but oddly elegant and classically nostalgic Royal Oak Chronograph in Yellow Gold. 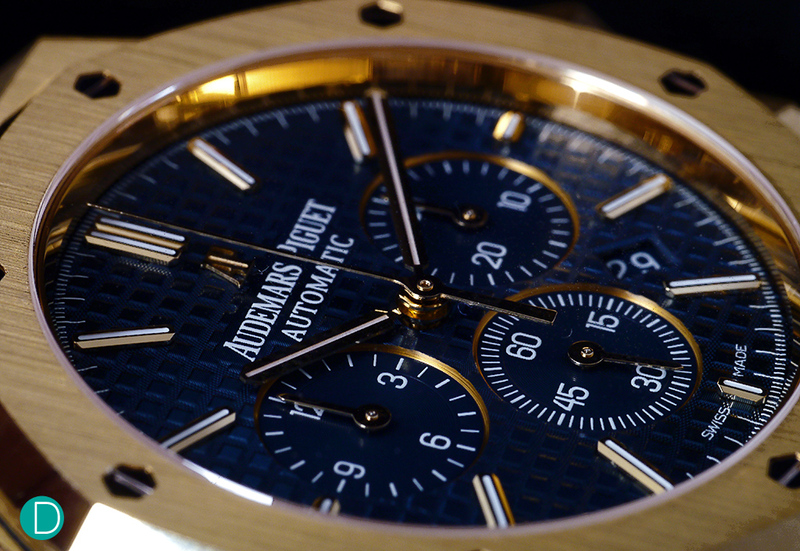 The Audemars Piguet Royal Oak Chronograph 41 mm in yellow gold (ref. 26320). 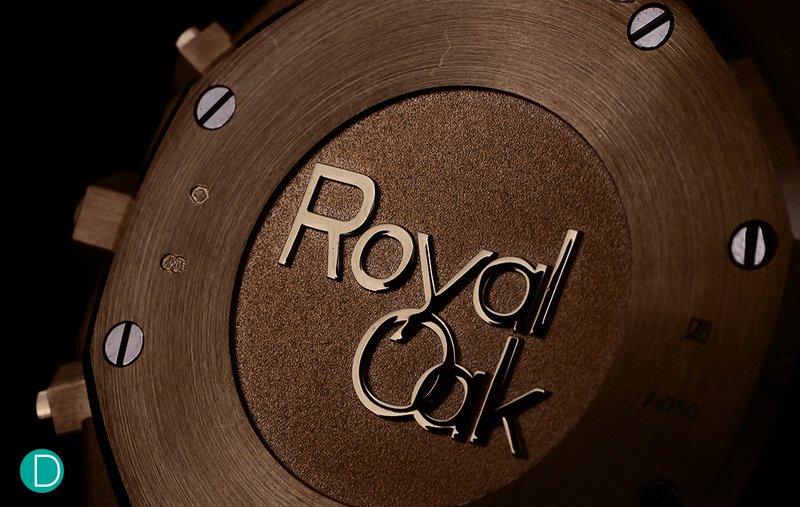 The casework of the Royal Oak is probably the best in the bracelet world. To find out why we would dare to make this statement, feel free to try one on at any Audemars Piguet boutiques near you. With the watch fit snugly on your wrist, slowly rotate it and observe the bracelet. You will find that the bracelet is designed to reflect light at multiple angles, thanks to its faceted links. The brushed finish on the surface is visually enhanced by its polished inner edges. For those familiar with tank tracks, that is exactly what I related to when first handling the Royal Oak. This robust design is almost industrial, especially when matched with the screw-down Octagonal bezel. True to its original intended purpose, the watch is designed as a sports and tool watch through and through. Closed caseback with the Royal Oak signature. The side profile of the case shows off the reduced Hexagon shaped crown and pusher guards. Between its predecessor rose gold self and the current yellow gold, our vote goes to the yellow. For one reason, the yellow gold is reminiscent of the cold-war era when politicians and business leaders wore yellow gold Rolex President Day-Date watches. (Yes and mafia bosses, drug lords, although both groups are hardly different.) Not that we have a predilection for the then and now successful geriatrics, we just find it heartening that the trend of wearing yellow gold watches has historical roots, while the rose gold trend is more a recent fad. Then of course, between a full gold and a stainless steel version, we would vote for the stainless steel. Simply because steel is more practical, does not weigh a tonne on the wrist and is a fraction of the price. As for the dial design, it is classic Royal Oak, decorated with a tapisserie guilloche. Notably, the dial also has matching yellow gold indices, subdial rings and hands. The watch is available in a dark blue or silver dial. The chronograph uses the Audemars Piguet 2385, which is otherwise known as the Frederic Piguet calibre 1185. While some may bemoan the fact that while other brands in Audemars Piguet’s vicinity have launched their own in-house movements with superior finishing, (think Vacheron Constantin, Patek Philippe) we want to point out that the calibre 1185 still has pretty impressive resume. This movement is among the thinness automatic chronograph movements ever made, measuring only 5.5 mm in thickness. Armed with 304 parts, it beats at 21600 vph and is fitted with 37 jewels with 40 hours of power reserve. The integrated column wheel and vertical clutch movement is also used on the old Vacheron Constantin Overseas Chronograph and the Breguet Marine Chronograph. Close up showing the deep lustre of the dark blue dial, nicely contrasted with the yellow gold markers and subdial rings. 41 mm on Peter’s wrist. Bling yes, but still an elegant Royal Oak. 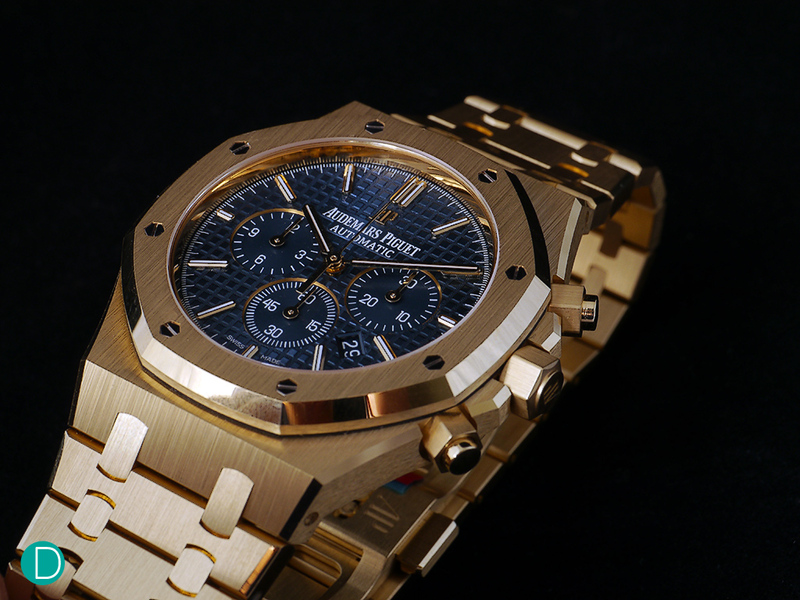 As you might be able to tell, we are fans of the Royal Oak design but remain apprehensive about the yellow gold model. For practical reasons of day to day wear as well as the hard to justify price premium over its steel. Then of course, that’s an industry norm and luxury watch collecting has never been a rational sport. The watch retails at S$79,400 and are available in Audemars Piguet boutiques.